It’s now a few days after the Sebald event at Snape Maltings and I’m not finding much coverage online. The Guardian hyped the Patti Smith concert and the Grant Gee film for days but doesn’t seem to have reviewed either one yet. A couple of online writers have added their musings. Check out Invective Against Swans Tumblr commentary and Skywritings blog post. In case anyone was wondering about the connection between Patti Smith and Sebald, apparently she gave out a list of her favorite books at the Melbourne International Arts Festival a few years ago. It’s an interesting blend of cult books (e.g. The Glass Bead Game), the expected Beat classics, Beat must-reads (Rimbaud, Blake, et al), more than a handful of genuinely great books, and two I’ve never heard of before. Several authors rate high enough that Smith recommends all their books, including Sebald. What’s next for Patti Smith? Apparently a detective novel. During her gig Patti Smith informed us that it was due to Susan Sontag’s personal recommendation (they were good friends) that she got interested in Sebald. She found herself mesmerised by the photograph on the cover of Austerlitz but in the end seems to have been completely absorbed by After Nature. To my mind Patti Smith’s poem in homage to Sebald – with the recurring reference to ‘Max’ and a detective double figure – really got to the heart of Sebald’s writing in a directly emotive rather than objectively critical way. It was refreshing and powerful. I also enjoyed her readings from After Nature. She mentioned that on the following day she had plans to visit the church which is connected with her Norfolk ancestors. My review of the weekend appears in the current issue of the New Statesman. It will migrate to the newstatesman.com next week. strage she did not include anything by Bolaño. I heard her in a “spoken word” concert in Gijon, Spain, where she read (interpreted) long passages of his work, e.g. “el ojo silva”. In other occassions she visited also Spain to read Lorca. 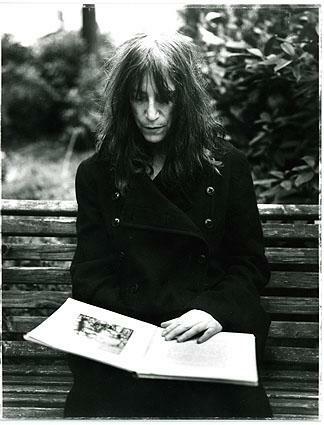 Patti Smith’s new book ‘M Train’ is a text-with-photos book that may well be of interest to you. Sebald comes up in conversation a couple of times in this discussion about the book recorded at New York Public Library: http://www.nypl.org/blog/2015/10/13/podcast-patti-smith. Patti Smith’s 40 Favorite Books – user's Blog!